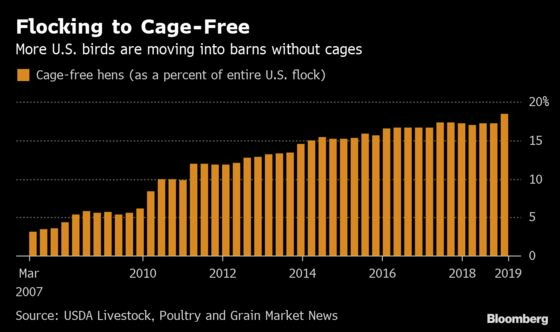 (Bloomberg) -- McDonald’s Corp.’s mission to use only cage-free eggs is rippling across the market. The world’s largest restaurant company is about a third of the way to meeting its goal of being entirely cage-free in the U.S. by 2025 -- a target it shares with a broad array of retailers and food producers. The expected surge in demand has sparked barn upgrades across the country over the last several years, with producers building facilities that give hens a bit more space. This increase in supply is reducing cage-free eggs’ market premium over regular eggs. 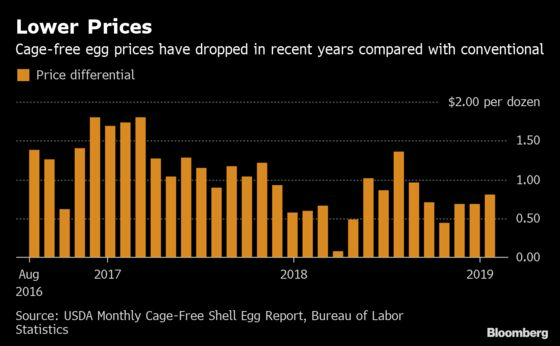 And the price gap is expected to narrow even further -- a welcome drop for U.S. consumers who are eating the most eggs per capita since 1973. The egg industry’s investment is a response to rising demand for cage-free eggs, which are regarded as more humane and even healthier, while producers are hoping to tap premium prices. The move illustrates how McDonald’s massive size can impact commodity markets. The company says it buys around 2 billion eggs a year in the U.S. -- or close to 2 percent of the nation’s annual production. A dozen cage-free eggs cost 81 cents more than conventional eggs in February, representing a premium of just over 50 percent, according to data from the USDA analyzed by the Egg Industry Center at Iowa State University. Cage-free eggs’ cost was double that of regular eggs as recently as 2017. Producers including Cal-Maine Foods Inc. are spending more to meet demand as it ramps up. The Jackson, Mississippi-based company, which is the biggest egg producer in the U.S., said earlier this month that it’s investing $148 million to increase cage-free capacity, adding 3.4 million birds to a facility in Utah.